Thomas Conveyor offers quality pallet flow racks and case flow systems! Pallet flow rack, also known as “gravity flow,” is a FIFO (first in, first out) dynamic storage system. Pallet flow rack makes it possible to achieve high density storage while maintaining a FIFO retrieval order and product handling efficiency. 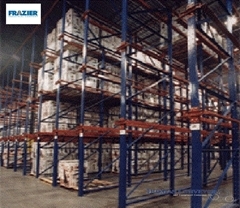 Gravity flow pallet racking maximizes actual storage space by minimizing aisles. Case flow storage systems help improve space capacity & picking efficiency, case flow systems also provide an excellent solution for low-inventory items. Quality Carton Flow Systems for all your Order Picking Applications! Push Back Racking is a pallet storage method that allows pallets to be stored from 2 to 6 deep on either side of an aisle, thereby storing pallet in a LIFO system.